Here is the result of the May WW2History.com members’ competition. 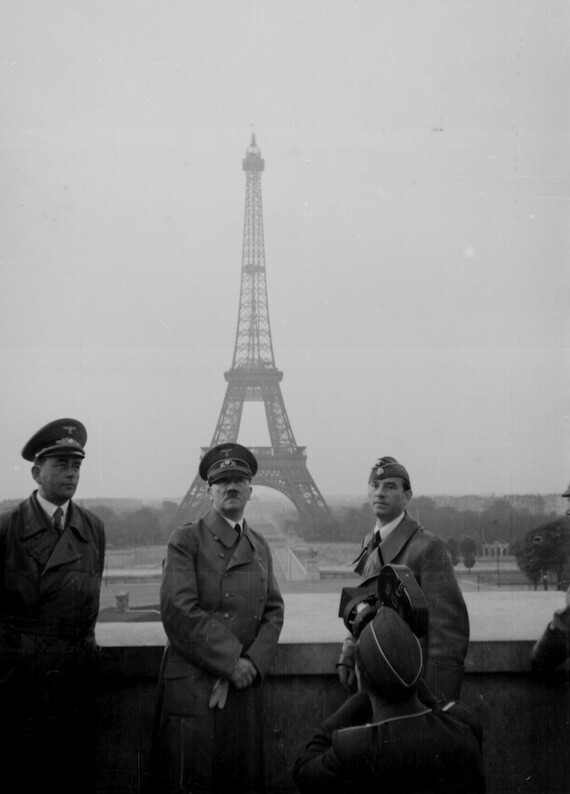 The question was – who is the Nazi on the left of this picture, accompanying Adolf Hitler on his victorious tour of France 70 years ago this month? I thought it was a tough question since the Nazi concerned doesn’t actually quite look his normal self in this photo. But it wasn’t a tough question at all for the subscribers to WW2History.com since the majority of people who entered the competition got the answer right. It’s Albert Speer, Hitler’s architect and later armaments minister. The three lucky winners, selected at random, who each receive a signed copy of Ian Kershaw’s brilliant ‘Hitler: Nemesis,’ are: Mr Flaherty of Preston, Mr Jackson of Brighton and Mr Pichardie of France. Congratulations, gentlemen! Your prize should arrive in the next few days. Incidentally, I wonder how many people know who is on the right of the picture? Now, surely, that will stump almost everyone. In fact, I’ll come clear here, I wasn’t absolutely certain who it was until I asked Sir Ian Kershaw himself to confirm the answer. There’s no prize for knowing the answer to this extra question (because there is a new and different competition already in the Members’ Zone for June) but I’ll give the answer later this week. Now I can see the pic. The man on the right is Arno Breker. He exhibited his works at the Orangerie in Paris in 1942. He also collaborated with Speer on the Germania project. He was a great friend of several French writers compromised during the war (Céline & Morand amongst others). His sculptures are the epitome of pompous vulgarity but his heroic (male) nudes were much loved by the homosexual set around Cocteau. Why did hitler always stand with his hands alike that? That woukd be a. Good question – does Sir Ian know that I wonder? Congratulations to the winners.